Let’s learn about prime factorization. What if you want to find all of the factors of a number? How could you do it? EASY! Use Prime Factorization! In fact, get out your Sieve of Eratosthenes to help you. This is a great tool because it can help provide a way for you to check for prime numbers. Prime Factorization is a method used to find all of the prime factors of a number. It utilizes a tree diagram for organizing your factors. Let’s try it using the number 24. 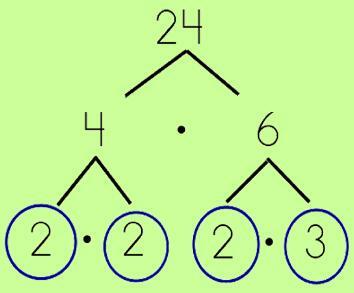 Start by writing the number and then drawing two tree branches underneath. Think of the factors of the number (or, if this seems hard, think, "What can I divide this number evenly by?" since sometimes it is easier to think backwards). 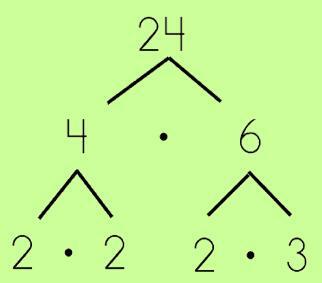 Write down the two numbers at the end of the tree branches. Keep factoring the numbers…until you get down to prime numbers. In this next example, you will see how the numbers 4 and 6 have been factored further until we get down to the primes. When you get to the prime factors, circle them. Re-write the prime numbers as an expression, using exponents. Voila! 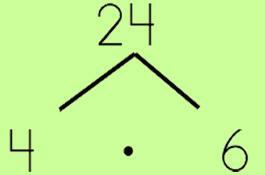 If you want even MORE practice, then click More Prime Factorization Practice.